There is a paradox in human evolution: It was once assumed not only that rational science originated with the ancient Greek philosophic schools, but that the belief systems of prehistoric hunter-gatherers were dominated by superstitions and irrational beliefs. If this was the case, then how did the human mind evolve the ability to do scientific reasoning if scientific reasoning was not required for hunter-gather subsistence? A similar (albeit broader) paradox led the 19th century naturalist Alfred Russel Wallace to conclude that the human brain could not be the product of undirected evolution because “Natural selection could only have endowed savage man with a brain a few degrees superior to that of an ape, whereas he actually possesses one very little inferior to that of a philosopher” (1). The 20th century anthropologist Sherwood Washburn reframed the paradox when he pointed out that the same brain that has been adapted for the needs of hunter-gatherer subsistence today deals with the subtleties of modern mathematics and physics (2). More recently, the psychologist Steven Pinker has noted that Wallace’s paradox of the apparent evolutionary uselessness of human intelligence is a central problem of psychology, biology, and the scientific worldview (3), while the biologist Edward O. Wilson regards it as “the great mystery of human evolution: how to account for calculus and Mozart” (4). In the early 1980s I studied physics, mathematics and applied mathematics at the University of Cape Town. While doing a course in history and philosophy of science, I became fascinated by this paradox in human evolution. I had an intuitive gut feeling that the art of tracking may have been the origin of science. I dropped out of university to do my own independent research and in 1990 published my first book, The Art of Tracking: The Origin of Science (6). 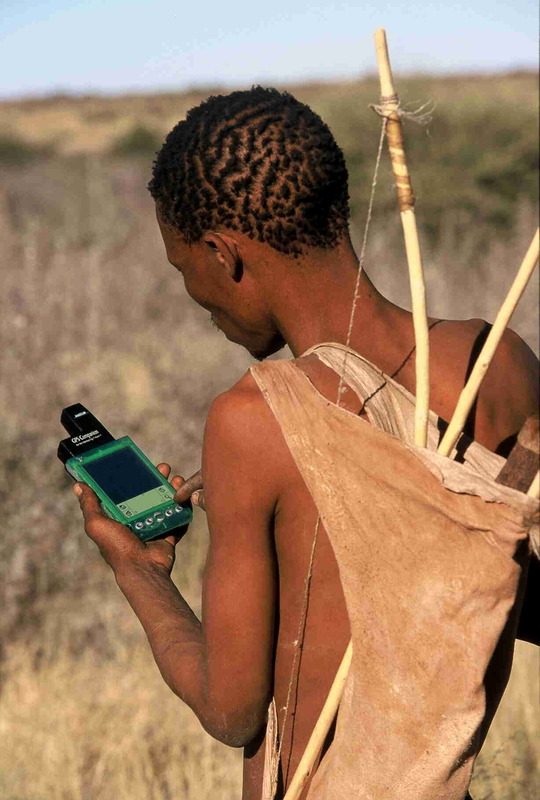 To do this research I had to become a tracker and spent long periods tracking with the Kalahari Bushmen. Since 1990 I focused on developing tracking into a modern science in order to create jobs for trackers, thereby preventing tracking from dying out. In easy tracking terrain, trackers may follow a trail simply by looking for one sign after the other, but in difficult terrain this can become so time-consuming that they may never catch up with their quarry. Instead of looking for one sign at a time, the trackers place themselves in the position of their quarry in order to anticipate the route it may have taken. They then decide in advance where they can expect to find signs, instead of wasting time looking for them. To reconstruct an animal’s activities, specific actions and movements must be seen in the context of the animal’s whole environment at specific times and places. !Nam!kabe Molote of Lone Tree in the central Kalahari, Botswana, was one of the last of the traditional !Xõ Bushman master trackers who grew up hunting with the bow-and-arrow in a nomadic hunter-gatherer band. When he died in 1995, an invaluable store of indigenous knowledge was irretrievably lost. At that stage my own tracking skills were not advanced enough to fully appreciate the depth and subtlety of his tracking expertise. We may never know how good the last generation of traditional master trackers was. Looking at the tracks of a solitary wildebeest of the previous evening, !Nam!kabe pointed out evidence of trampling, which indicated that the animal had slept at that spot. He explained that the tracks facing away from the sleeping place had been made early that morning and was therefore relatively fresh. The tracks then followed a straight course, indicating that the animal was on its way to a specific destination. After a while, !Nam!kabe started to investigate several sets of footprints in a particular area. He pointed out that these footprints all belonged to the same animal, but were made during previous days. He explained that that particular area was the feeding ground of that specific wildebeest. Since it was, by that time, about midday, it could be expected that the wildebeest may be resting in the shade in the near vicinity. He then followed up the fresh tracks, moving stealthily as the footprints became very fresh, until he spotted the animal in the shade of a tree, not very far from the area that he identified as its feeding ground. When we returned to our camp, the younger hunters decided to track the lioness. We set out with !Nam!kabe, his son !Nate, Kayate and Boroh//xao, armed with spears and throwing sticks. We could see from her tracks that she circled downwind to look at !Nam!kabe and myself as we were studying her tracks. Kayate said that we must follow her tracks and shout at her to chase her away, because she is too close to our camp. That night, as we sat around the fire, they told stories of tracking lions and encounters with lions, times when they had to sleep in trees. And once in a while, !Nam!kabe would feel a burning sensation under his armpits and say that the lioness must be near our camp, stalking us from the downwind side. Then they would shout, banging on pots and throw sticks into the dark, downwind from us where they thought the lioness might be. This was repeated a number of times through the night until the dawn finally broke. We then followed her tracks to see where she was going. It was important to see how far she had gone and whether she had left the area or not. We found the place where she had slept for the night. We followed her tracks for most of the day, until we were satisfied that the lioness had moved out of the area and was no longer a threat to us. The interpretation of the wildebeest and lion tracks was based not on the evidence of the tracks alone, but also on the trackers’ knowledge of animal behavior, on the context of the tracks in the environment, and on the time of the day. Since tracks may be partly obliterated or difficult to see, they may only exhibit partial evidence, so the reconstruction of these animals’ activities must be based on creative hypotheses. To interpret the footprints, trackers must use their imagination to visualize what the animal was doing to create such markings. Such a reconstruction will contain more information than is evident from the tracks, and will therefore be partly factual and partly hypothetical. As new factual information is gathered in the process of tracking, hypotheses may have to be revised or substituted by better ones. A hypothetical reconstruction of the animal’s behaviors may enable trackers to anticipate and predict the animal’s movements. These predictions provide ongoing testing of the hypotheses. Perhaps the most significant feature of creative science is that a hypothesis may enable the scientist to predict novel facts that would not otherwise have been known (7). A simple example of how scientific reasoning may result in the prediction of novel facts in tracking is illustrated by a set of caracal (wildcat) tracks I found at Cape Point near Cape Town. Looking at the tracks I could visualize how the caracal was walking when it turned and pounced towards the left, twisted around and jumped back towards the right. There were no signs or tracks of the animal it was pouncing at. Initially I thought of two explanations. At first I thought it could not have pounced at a bird, because it pounced twice, and if the bird flew away, why would it pounce a second time? So I thought the fact that it pounced twice indicated that a mouse ran from the first pounce landing position to the second pounce landing position. But there were no sign of mouse tracks, so I thought that maybe the wet sand was hard enough that the mouse tracks did not show, or that instead of a mouse it was perhaps a tiny shrew. But neither hypothesis made me feel confident that it was the right explanation, leaving me feeling uneasy—it was a bit of a mystery to me. The next morning I thought of a novel solution that was the result of two things that made me feel uneasy: first, I could not find any sign of mouse tracks, yet even the smallest mouse should have left faint signs of its sharp claws digging into the sand as it tried to get away from the caracal; second, the second time the caracal jumped (after twisting around), the bounding gait footprints left deep impressions, yet the stride length to the point where it landed was very short. What I think must have happened is that it tried to pounce on a small bird sitting on the ground. The bird flew up in the direction of the second set of “pounce tracks,” so the caracal twisted around and leapt straight up into the air to catch the bird in mid-air. This would explain why the bounding tracks for the second leap left deep imprints (its feet was pushing down into the ground, not backwards) and why the stride length was so short (it went straight up and down). It would also explain why I could not find any mouse tracks or any other tracks. The tracks of the little bird, where it was sitting, would have been obliterated by the tracks of the caracal when it tried to pounce on it the first time. I did not initially think of this explanation because at the time I did not know that a caracal could leap up and catch a bird in mid-air. In terms of my own experience at the time, this was a new behavior that I did not know of. As with any set of data that creates a puzzle that does not fit your preconceived expectations, your subconscious needs to work on it to create a new hypothesis; in other words, I had to “sleep on it” before thinking of a solution the next morning, resulting in an “aha moment.” In mathematics and science, the creation of a hypothesis often requires a subconscious period of incubation preceding a sudden illumination (8). Since the caracal is nocturnal, it is unlikely that I would ever observe this activity. However, creating a hypothetical explanation of the tracks enabled me to predict a novel fact about the caracal’s behavior. Empirical knowledge is knowledge based on inductive-deductive reasoning, and “creative science” is knowledge based on hypothetico-deductive reasoning. Let us look at a simple, every-day example that everyone can relate to. An example of inductive-deductive reasoning would be: Based on past experience, we know that the sun always comes up in the east in the morning. Therefore we can predict that the sun will come up in the east tomorrow morning. We use induction to make a generalization (the sun always comes up in the east), which we then use to deduce a prediction (therefore the sun will come up in the east tomorrow). Inductive-deductive reasoning does not explain why the sun comes up in the east every morning and cannot make novel predictions. An example of hypothetico-deductive reasoning would be: A philosopher living in ancient Greece may have come up with a hypothesis that the sun appears to come up in the east every morning because the Earth rotates around its axis. The philosopher would then have been able to predict that the sun will always come up in the east every morning. Hypothetico-deductive reasoning explains why the sun comes up in the east every morning. Furthermore, this hypothesis would have enabled the philosopher to make a novel prediction—if you travel to the North Pole the sun will not appear to come up every morning. We can now look at how the logic of science connects tracking and modern science. An example of inductive-deductive reasoning in tracking would be the way tracks are identified as that of an animal belonging to a particular species, such as the porcupine. Footprints may vary according to the softness or hardness of the ground, so we need to look for the characteristics which different footprints have in common. The inductive stage of the argument may be as follows: all porcupines that have been observed produced tracks which had certain characteristics, and no porcupines have been observed to produce tracks that did not have those characteristics. We therefore assume that all porcupines leave tracks which have those specific characteristics. Furthermore, no other animals have been observed to leave tracks which had exactly the same characteristics. We therefore assume that only porcupines leave tracks which have those specific characteristics. The deductive stage of the argument would then be as follows: we assume that all porcupines and only porcupines leave tracks which have specific characteristics. We conclude, therefore, that any particular track observed to have those specific characteristics would have been made by a porcupine. In an inductive argument by simple enumeration, the premises and conclusions contain the same descriptive terms (9). It is therefore simply a process of empirical generalization, which does not lead to progress in science because they may only lead to the discovery of facts similar to those already known (7). Inductive-deductive reasoning is based on direct observations and ordinarily recognizes apparent regularities in nature. Inductive empirical knowledge, therefore, is based on a trial-and-error accumulation of facts and generalizations derived by simple enumeration of instances. It does not explain observations and cannot result in the prediction of novel facts. It can only predict particular observations similar to those that have been observed in the past. Predictions are therefore simply based on experience. In contrast to inductive-deductive reasoning, hypothetico-deductive reasoning involves the explanation of observations in terms of hypothetical causes. The hypotheses may be used as premises in conjunction with initial conditions from which certain implications may be deduced. Some of the implications deduced in such a way may include novel predictions. Hypothetico-deductive reasoning in creative science is an exploratory dialogue between the imaginative and the critical, which alternate and interact. A hypothesis is formed by a process that is not illogical but non-logical, i.e. outside logic. But once a hypothesis has been formed it can be exposed to criticism (10). A characteristic feature of a theoretical science is that it explains the visible world by a postulated invisible world. In physics, for example, visible matter is explained by hypotheses about an invisible structure that is too small to be seen (11). Similarly, in the art of tracking, visible tracks and signs are explained in terms of invisible activities. A sympathetic understanding of animal behavior enables the tracker to visualize what the animal may have been doing in order to create hypotheses that explain how visible signs were made and how they are connected. Visible signs are therefore connected by invisible processes. These postulated connections are inventions of the tracker’s imagination. Although these hypothetical connections cannot be seen, the conclusions that can be deduced from them enable the tracker to anticipate and predict visible signs. A theoretical science such as physics is analogous to tracking in the sense that observable properties of the visible world may be regarded as signs of invisible structures or processes. The force of gravity (in Newton’s theory), or the gravitational field (in Einstein’s theory), or more recently the Higgs Boson, cannot actually be seen. Its postulated existence is only indicated by observable effects on bodies similar to those that such a force (or field) would have on bodies. Nuclear particles cannot be seen. Physicists can only see signs, such as “particle tracks,” that correspond to those that would be made by hypothetical particles. We may now make the link between tracking and the origin of scientific reasoning through two fundamentally different types of tracking—systematic tracking and speculative tracking. Systematic tracking involves the systematic gathering of information from signs, until it provides a detailed indication of what the animal was doing and where it was going. In order to reconstruct the animal’s activities, the emphasis is primarily on gathering empirical evidence in the form of tracks and other signs. Systematic tracking involves inductive-deductive reasoning. Speculative tracking involves the creation of a working hypothesis on the basis of initial interpretation of signs, knowledge of the animal’s behavior and knowledge of the terrain. With a hypothetical reconstruction of the animal’s activities in mind, trackers then look for signs where they expect to find them. The emphasis is primarily on speculation, looking for signs only to confirm or refute their expectations. When their expectations are confirmed, their hypothetical reconstructions are reinforced. When their expectations prove to be incorrect, they must revise their working hypotheses and investigate other alternatives. Speculative tracking involves hypothetico-deductive reasoning. In systematic tracking, trackers do not go beyond the evidence of signs and they do not conjecture possibilities that they have not experienced before. Systematic tracking essentially involves empirical knowledge based on inductive-deductive reasoning. In speculative tracking the trackers go beyond the evidence of signs. Anticipation and prediction are based on imaginative preconceptions. They conjecture possibilities which are either confirmed or refuted. Speculative tracking involves a continuous process of conjecture and refutation and is a creative science based on hypothetico-deductive reasoning. Systematic tracking involves a cautious approach. Since the trackers do not go beyond direct evidence, the chances of losing the trail are small. Even anticipation and prediction do not involve great risk of losing the trail, since they are based on repeated experience. Provided the trackers can progress fast enough, they will eventually overtake their quarry. While systematic tracking may be very efficient in relatively easy terrain, it may prove to be very time-consuming in difficult terrain. Speculative tracking, on the other hand, requires a bold approach. Anticipating the animal’s movements, by looking at the terrain ahead and identifying themselves with the animal on the basis of their knowledge of the animal’s behavior, trackers may follow an imaginary route, saving much time by only looking for signs where they expect to find them. Trackers may visualize animals moving through the landscape and ask themselves what they would do if they were the animals, and where they would have gone. The tracker creates an internal simulation of different possibilities, thereby simulating and predicting the future. By predicting where animals may have been going, the trackers can leave the trail, take a short cut, and look for the tracks further ahead. In principle, there is a fundamental difference between systematic and speculative tracking. In practice, however, they are complementary, and a tracker may apply both types of tracking. In very easy terrain, such as open, sparsely vegetated, sandy terrain, systematic tracking may be so quick that it may not be worth risk losing the trail by speculation. In very difficult terrain, such as very hard, rocky terrain, a tracker may not get very far with systematic tracking, so that speculative tracking may be the only way to overtake the quarry. Trackers may also alternate between systematic and speculative tracking as the terrain and vegetation changes during the course of tracking an animal. Finally, we can now look at when systematic and speculative tracking evolved, and therefore the evolutionary origins of creative science. A wide array of evidence suggests that hominids were actively hunting, at least by the time that Homo erectus appears about two million years ago (12, 13, 14, 15). The evidence for hunting includes a large proportion of bones with cut-marks indicative of flesh removal from regions of shafts that would not have had flesh had they been scavenged. Evidence for endurance running as early as two million years ago may indicate the evolution of persistence hunting (16, 17, 18, 19). Persistence hunting takes place during the hottest time of the day and involves chasing an animal until it overheats and eventually drops from hyperthermia (17). The earliest evidence of hunting that would have involved systematic tracking therefore goes back about two million years to Homo erectus (5). The earliest direct evidence of speculative tracking is found about 70 000 years ago. Animals are always alert for predators tracking them, looking back down their own trail. It is therefore not possible to stalk an animal using systematic tracking. Hunting with missile weapons would therefore have required a very advanced level of speculative tracking (5). The bow and arrow and the spear thrower were not invented until quite recently, probably after the origin of modern Homo sapiens (20). The earliest evidence of bow and arrow was found in South Africa and dates to 71 000 years ago (21). Evidence of symbolic activities, including both red ochre and seashells that were clearly collected for their aesthetic appeal, date back to 110 000 years ago in South Africa (22). This may provide indirect evidence of the creative cognitive abilities required for speculative tracking more than 100 000 years ago with the evolution of Homo sapiens (5). In contrast to systematic tracking, speculative tracking required a fundamentally new way of thinking. The evolution of speculative tracking may have resulted in the cognitive abilities required for creative scientific thinking. 1. Wallace, A. R. 1870. “The Limits of Natural Selection as Applied to Man.” In Contributions to the Theory of Natural Selection. A Series of Essays. London and New York: Macmillan. 2. Washburn, S. L. 1978. “The Evolution of Man.” Scientific American, September, vol. 239 no. 3. 3. Pinker, S. 1997. How the Mind Works. London: Penguin Books. 4. Wilson, E. O. 1998. Consilience. The Unity of Knowledge. London: Abacus. 5. Liebenberg, L. 2013. The Origin of Science. Cape Town: CyberTracker. 6. Liebenberg, L. 1990. The Art of Tracking: The Origin of Science. Cape Town: David Philip. 7. Lakatos, I. 1978. The Methodology of Scientific Research Programmes. Philosophical Papers Vol. 1. Edited by J. Worral and G. Currie. Cambridge: Cambridge University Press. 8. Hadamard, J. 1945. The Psychology of Invention in the Mathematical Field. New York: Dover Publications, Inc.
9. Losee, J. 1972. A Historical Introduction to the Philosophy of Science. Oxford: Oxford University Press. 10. Medawar, P. B. 1969. Induction and Intuition in Scientific Thought. Philadelphia: American Philosophical Society. 11. Popper, K. R. 1963. Conjectures and Refutations. London: Routledge and Kegan Paul. 12. Potts, R. 1988. “Environmental Hypotheses of Human Evolution.” Yearbook of Physical Anthropology 41, 93–136. 13. Bunn, H.T. 2001. “Hunting, power scavenging, and butchering by Hadza foragers and by Plio-Pleistocene Homo.” In: Stanford, C.B., Bunn, H.T. (Eds. ), Meat-Eating and Human Evolution, Oxford University Press, Oxford, pp. 199-218. 14. Dominguez-Rodrigo, M. 2002. “Hunting and Scavenging by Early Humans: The State of the Debate.” Journal of World Prehistory 16, 1-54. 15. Braun, D.R., J.W.K. Harris, L.C. Bishop, B.G. Richmond, and M. Kibunjia. 2010. “Early hominin diet included diverse terrestrial and aquatic animals 1.95 Myr ago in East Turkana, Kenya,” Proceedings of the National Academy of Sciences (U.S.A.)107(22): 10002-10007. 16. Bramble, D. M., and D. E. Lieberman. 2004. “Endurance running and the evolution of Homo.” Nature 432:345–52. 17. Liebenberg, L. 2006. “Persistence hunting by modern hunter-gatherers”. Current Anthropology. 47, 1017–1025. 18. Liebenberg, L. 2008. “The relevance of persistence hunting to human evolution”. Journal of Human Evolution. 55, 1156-1159. 20. Shea, J.J., 2006. “The origins of lithic projectile point technology: evidence from Africa, the Levant, and Europe.” Journal of Archaeological Science 33, 823–846. 21. Brown, K.S., C.W. Marean, Z. Jacobs, B.J. Schoville, S. Oestmo, E.C. Fisher, J. Bernatchez, P. Karkanas and T. Matthews. 2012. “An early and enduring advanced technology originating 71,000 years ago in South Africa.” Nature. 491, 590-593 doi:10.1038/nature11660. 22. Marean, C.W. 2010. “When the Sea Saved Humanity”. Scientific American, Volume 303, Number 2. This entry was posted in 1 Tracking Science, 3 The Origin of Science, 3.1 Scientific Reasoning, 4 The Art of Tracking and tagged Art of Tracking, Logic of Science, origin of science on 2014/06/11 by Louis Liebenberg.